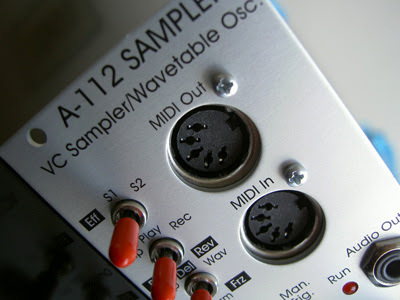 Doepfer A-112 Sampler/ Wavetable Osc. Rediscovery of another Doepfer classic - the A-112. This module was in my first order five years ago. It survived in my system for a while and was sold without much remorse. Since then, we've been treated to several dedicated delay modules, The Harvestman's Tyme Sefari & Piston Honda and, more recently, Make Noise's Phonogene. These modules share much in common with the A-112 and got me wondering why I'd ditched it - was it because of its lo-fi character or because I wasn't ready for it? As you can hear, the A-112's 8-Bit nature means it's dirty, noisy & crunchy, but not to the extent that it's musically unusable. Far from it: it can make a huge difference in, or form the basis of, a patch, adds character and, despite its limited 128 kilobyte memory, is bags of fun. That said, the interface isn't perfect - it's too easy to accidentally wipe a stored wavetable due to a false flick of a switch - but it is immediate. Also, Doepfer's Sample Dumper application is in need of an update & port to OSX as this is key to getting the most out of the wavetable mode (I borrowed an old laptop running Win98!). Another criticism is that sampling at the highest resolution (Tune @ '10') also caps the highest pitch CV it will respond to. Conversely, I'd also like it to go slower because of its ability to record CVs. A simple mod (remove passive filter jumper and bypass cap C11) makes this possible. Details are outlined in this message at the Doepfer Yahoo group. A simple dual gang switch would be a quick mod If you want both options. The Harvestman & Make Noise instruments might be a refinement of the original concept, offering better fidelity and more functions but they also come with a higher price tag and take up more rack space. If you're ok with its gritty sound, for the €150, 10HP entry fee, you really can't go wrong with the A-112. Doepfer's Sample Dumper can be downloaded here. Wiard's Wave256 & Move256 can be found here, more wavetables are available at the Wiard Yahoo Group. I'll be playing live on Friday 29th July at Basic Electricity #1, hosted by Auxxx in Berlin. 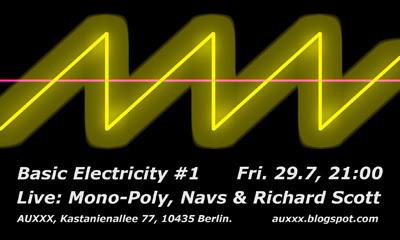 Noodle-Chef Mono-Poly and WiGi-Wizard Richard Scott are also on the bill on modular and Buchla Lightning. The Auxxx is in the Lichtblick Kino and is an intimate venue with comfy seats and good sound. If you're in town, it would be great to see you! More info at the auxxx blog.